Occasionally, the news reports on the crisis and daily horror at our border. The impact cannot be truly understood unless one goes there, takes a look around, and talks to the overworked Border Patrol agents and the people who live there. So, I went to southern Arizona for 5 days at the end of October. In this brief space, I want to share what I saw and learned. We know our nation is being invaded by millions of illegal aliens every year. Their arrival brings a host of ills upon our fair land: crime, disease, exploding deficits, multilingualism, and downward pressure on wages to name a few. Our elected officials and the Mexican government say, "America should welcome law abiding undocumented workers who are only doing jobs Americans won�t do." But that is the problem. They are not law abiding. They break our laws every minute of every day that they are in this country illegally. And they broke a host of laws to get here. As I drove from Phoenix to the border, I encountered evidence of the costs and cause of the crisis. I saw billboards every 10 miles -- reminding people to report illegal immigration. I saw abandoned checkpoints where the USBP once searched for illegal aliens. Current law prevents them from operating those permanent checkpoints now. I saw government sponsored day-labor hiring zones which are also used as transfer points by the professionals who import the illegal aliens and transport them from the border to every community in our nation. I saw free health care clinics with signs in Spanish and Arabic, but not in English. But, it was what I did not see on the border itself that was most disturbing. 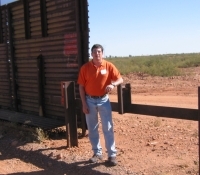 During my three days traveling the border road, I only encountered two USBP agents, although I did encounter several Minuteman patrols. Fences extended only 2 miles on either side of the official entry points. There were places where one only needed to cross the street to enter our country illegally. I also attended a conference on border issues sponsored by The American Cause. There, I met with local ranchers whose property is being spoiled, whose families have been harassed, beaten, and raped, and whose livestock has been killed. I met with medical experts who have seen hospitals bankrupted and closed after being overburdened by drug resistant TB, leprosy, Chagas, and other exotic and contagious diseases. I met with a number of border patrol agents and other national security experts who have left government service in frustration. The borders are exposed, and increasing numbers of those crossing come from countries like Iran, Saudi Arabia, Afghanistan, Pakistan, and Syria. Yet, seemingly nothing is done to protect our southern flank. I also met with fellow immigration activists, including Minuteman founder Chris Simcox, and discussed working together to address the problems faced along the border and throughout the nation. Our southern border is in crisis. Congress offers only cosmetic solutions, while President Bush pushes for amnesty. Peoples' lives are being destroyed. A new course is needed; a new commitment to protecting the American people is required. Our border must be secured. The America First Party must lead the way.